Hockey Plumber: Tomas Vokoun? Say it Ain't So Randy! 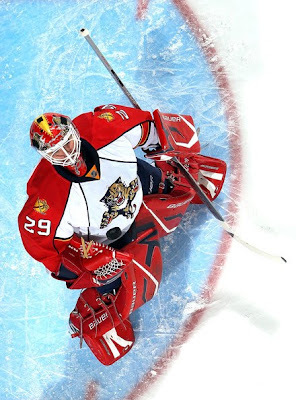 We have searched and searched, but cannot find a reason anywhere for why the Florida Panthers would want to deal goaltender Tomas Vokoun. "There's no player off limits," Sexton said. "There are players we'd like to keep, but at the end of the day Wayne Gretzky was traded. We have to get better and get our team to the point where we want it to be. Sometimes you have to make hard decisions." Naturally, since then there has been speculation surrounding all of the Panthers' top players. Nathan Horton's dedication has been placed in to question, Steven Weiss has struggled to score lately, and David Booth's ability to absorb elbows to the head has raised doubts... kidding. Many reasons have be cited for why the Panthers would like to move assets to start anew. Yet, most disturbing has been the notion that Sexton would ask Vokoun to waive his "No Trade Clause" and deal away one of the few consistent performers in the Panthers line up. Consider that going into the Olympic break, Vokoun leads all NHL netminders in save percentage and shutouts with seven (nearly 30% of the teams' wins). He has a 2.36 GAA and has faced more shots than any other goalie! Half of the games that the Panthers have won are mostly because of Vokoun's heroics. The other half are ENTIRELY because of Vokoun. Can anyone tell us how Sexton could improve the team by trading the only player he has that could claim to be as good as anyone in the game? Maybe Sexton just spoke out of frustration. Maybe there will be no Florida fire sale. Maybe the rumors are off the mark. However, if Vokoun is moved at the deadline to a contender, that teams' entire fan base should line up outside the arena in Sunrise, FL to shake Sexton's hand the next morning.